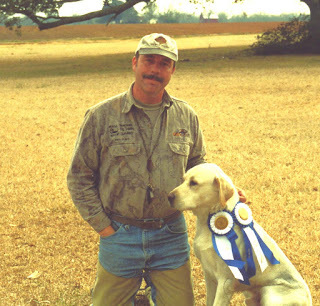 Canine Aggression Issues with Jim Crosby: Learned helpless: PLEASE DON'T KILL ME! I’m certain you have seen it - the dog that immediately cowers in front of anyone and anything. He seems to be calling out “I’m pitiful-pet me!” This is often accompanied by urinating a little and behavior that, in a human, we would see as clear groveling. Many people see this and think “Oh my, he is such a submissive dog!” and assume that this poor beast is going to be easy to deal with. Others see this as a dog that lacks spine and they get forceful, trying to “toughen up” this pup. Both sets of responses are wrong. Sure, the dog is giving signals that add up to the picture that in some heads screams “submissive”. If the groveling got any worse we would be embarrassed. These postures are associated with dog to dog signaling that one dog has surrendered to another dog. Some trainers tell us that this is a good thing, and that we have successfully become the “alpha” in the relationship, that we have accomplished something good, something our relationship should be based on. Science tells us that this may not be “submission” (and that is a whole ‘nother discussion), but something very different. There is a term for this. It’s called LEARNED HELPLESSNESS. We see it in people. Victims of domestic violence, child abuse, sexual abuse. This behavior may be a symptom of Post Traumatic Stress Disorder. A dog acting this way does not mean we have achieved training success. Human victims can learn that no matter what they do they can’t win. They will be beaten down and hurt. As a result of this repeated beating down, they learn to give up before things escalate to try and minimize the damage. They suffer and quit to survive. Dogs can do the same. The most common factor I have seen in animals that show learned helplessness is fear caused by force. Force that was applied excessively, inconsistently, and with poor timing. It is true that scientists have shown that punishment “works”. After all, an animal that experiences pain and violence after they do something will try and stop the pain. If that pain is closely linked with a specific circumstance of action the animal will learn to avoid that particular set of circumstances, and may learn to generalize and associate the pain with similar situations. This creates problems as they travel down this road. First off, why do we want an animal performing a behavior out of fear of pain? Do we need to "prove" something? I don’t want that relationship with my own dogs. Having a dog look over their shoulder all of the time waiting for pain is not the way I want my dog to view me, or our relationship. A dog acting from fear, if given the opportunity, may finally decide she has had enough and head for the hills. To reliably avoid pain they simply avoid the entire surrounding environment. That makes sense from their point of view. Also sensible to them may be a “last stand” to either survive or die. This is seen in humans with victims who finally, after years of abuse, react massively toward the abuser. Dogs don’t usually have guns, so in a dog’s case this may be with a bite. If their abuser or “trainer” has responded to lower level warnings and attempts at defense with more force and more fear, then the bite may be serious and, to those on the outside, out of proportion to the perceived provocation. For trainers, even those who are not using force or fear, part of the equation are the twin issues of timing and consistency. Timing in dogs is critical. Dogs associate good or bad with the actions that occurred immediately before the good or bad thing happened. If punishment is presented, the administration of the aversive, the punisher, has to be dead on with the unwanted behavior to be effective and clear. If Fred the Beagle, for instance, poops on the floor at 10 am, but the owner punishes him at 12:30 when he gets home from the store, Fred is getting an unclear message. He is more likely to associate the punishment with whatever he did just before the punishment. So if Dad called him over and then punished him for pooping on the floor, poor Fred the Beagle is confused: was he punished for coming to Dad? What was the whole deal about the poop? What poop? Consistency is the other twin, the flip to timing’s flop. For instance: this morning you are in your sweats before you get dressed, take Fred out for his walk, and love him as he jumps up and plays with you. Forty five minutes later though, after showering and getting dressed for work, Fred gets smacked for doing the same exact thing. Fred’s fashion sense is limited: he may not see your sweats and your work clothes as that different. Context seems the same to Fred, so now he has been rewarded and punished for the same behavior. Instead of using force, punishment, and risking the utter confusion of a dog that may lead down the bumpy road to learning they can never do anything right, how about we try another idea? Let’s show our dogs what we want, mark those desirable behaviors, and then reinforce them. Instead of teaching learned helplessness, how about we teach learned confidence? 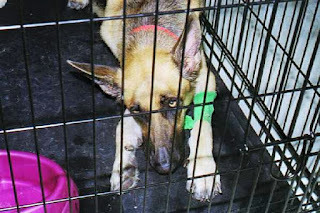 In my years competing with field dogs, I saw plenty of animals that had developed highly trained learned helplessness. When the handler sent them out they constantly looked back, head down and tail tucked, waiting for the zap of electricity that told them WRONG! When they came into a new environment, with novel challenges, they were a sorry sight to see. Fear dripped off them, and although they followed directions, there was no joy in Mudville. They had no confidence of their own and no confidence in their handler. Somehow I accidentally learned a different (I think better) way. My dogs needed to be secure, confident, and able to make choices. This took a lot of training and repetition and patience and holding back from assessing the trainee as stupid or obtuse, but my dogs finally taught me. I learned the lessons from them. They resisted learning helplessness and I learned to be consistent, clear, and that fear bred only more fear. I owe that lesson to my dogs, and I own that lesson now. For others, I can simply let my experience be a guide, a suggestion. Learned helplessness and canine PTSD are not the marks of a submissive dog. They are not goals to achieve. They are signs of a dogs that has been pushed too far, too often, with the wrong methods, and is simply trying not to be killed. Please, don’t put your dogs in that space. Instead of imprisoning them in fear, teach them confidence and the ability to make choices. Give them the keys to success. Then sit back and enjoy the ride.